Thank you for inviting me to see and report on your latest pantomime written once again by your own Tom Everitt and directed by ‘mum’ Catherine Everitt. The advantage, of course, of using ‘in house’ pantos is that you can write to the talents, and limitations, of both your members and your venue without the expense of royalties, not to mention the hassle of getting the author’s written permission to make changes. Both Tom and Catherine have a finely tuned understanding ofthe unique panto genre and you included all the ‘musts’ – sweets to the audience, awful jokes, a singalong, a traditional ‘Dame’ alongside a strutting principal ‘boy’ and a pretty principal girl. You also got the fairy talking in rhyme as she should, entering from SR – the ‘baddie’, in keeping with tradition, used SL. Having said that you stuck to the rather esoteric ‘musts’ inherent in pantoland, I was pleased to note that you added variations from time to time, such as the rather different ‘it’s behind you’ scene. Excellently done. I noticed that, in common with some other amateur groups I have seen recently, you used some projection and moving and/or changing LED lights to enhance the set which worked very well. All the audio and visual effects were excellent incidentally, especially the storm and howling at the beginning and your pyros worked well too. Full marks to all your techies. A particularly nice touch was your overture which incorporated many of the songs included in the show. Well done to whoever wrote this for you. Pete Stokes your MD? On the subject of songs, I felt those included were particularly well chosen, coming as some did from my own childhood pantomimes and the addition of new words to, for example, The Lion Sleeps Tonight was effective. I also liked the original opening number written by Catherine and Dave Bowden. The mixture of live music and tracks worked well too. You had a good set, designed by Sophie Koziol and built in house, which enabled your SM, Martin Hailey, to run the many scene changes smoothly. The Wolf’s den was particularly effective. Make up, Sophie again with Jody Cook, was good, particularly the Wolf, but I have to say that Tom’s make up as the Dame was just about the best Dame make up I have seen. Very well done on this, shame there is not an award for make up or I would nominate you. Ritchard Tysoe’s programme was well laid out with some good photographs – nice to see that the cast pics were in character. It was a shame, I felt, that you did not have room for a list of scenes though. The costumes from your fairly large wardrobe team were another excellent aspect of this production and I loved the LEDs on some of the shoes. You all made good use of the auditorium which is always essential for full audience participation. The chorus sang and danced well and even the youngest displayed great confidence. Blacksmith Herbert Herbert, played by David Harnett,delivered his dreadful jokes deadpan. Jerry Cake, Alison Hartnett, the other prime suspect when it comes to purveying dreadful humour, worked up a good rapport with the audience with the ‘Jerry Berry’ routine. Tom, Jody Cook, you had a very good swaggering stride and you made an excellent Principal Boy. I really felt that Tom Everitt really relished the role of Dame Patty Cake. I worried a bit for you Tom as you were obviously struggling with a cold and I was afraid you might lose your voice completely; however, you got through it well on the night I came, I just hope you recovered in time for your subsequent performances. You covered the moment when something went wrong, ad libbing manfully! Annabelle Herbert, played by the versatile Sophie Koziol, the Little Red Riding Hood of the title, looked pretty – just as a Principal Girl should. Your singing voice was a bit on the quiet side although you acted the part very well. Dave Bowden’s cockney wide boy Wolf was a triumph of evil! The Wolf, magicked we gathered by the Wizard into human form, looked great and acted well – you certainly made this part your own. Nigel Bacon played the rather ineffectual Wizard very well and your interaction with Tom was very good. Libby Becks’ Lady of the Wood drifted in and out just as required. I always think that the part of a pantomime Good Fairy is a difficult one – rhymed speech, a bit of waving of hands and/or wands, nothing much to get your teeth into and develop the character. Well done. 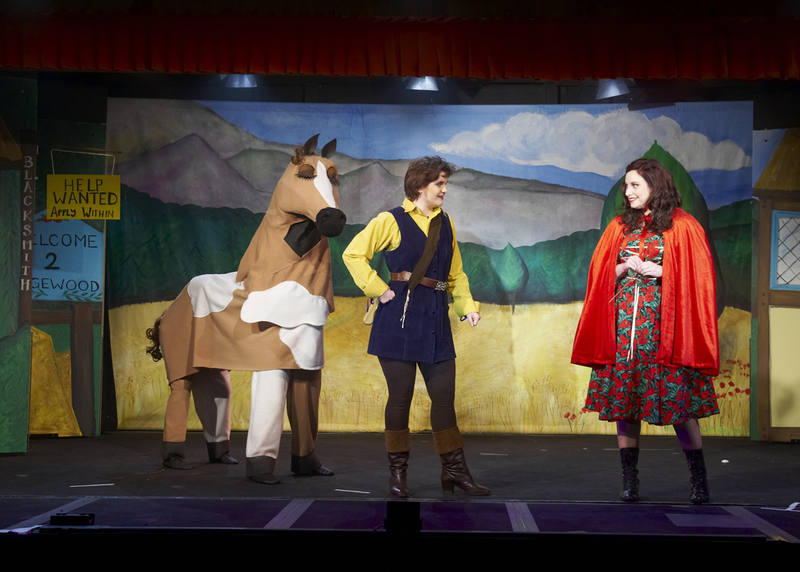 The panto horse, Sparky, worn by Ruby Watkins and Libby Wiles moved confidently at all times. Very good. We never saw Rob Watkins’ face, hidden as it was inside a grotesque troll mask, but you acted and moved well, albeit silently! Eve Berry’s Granny was another good portrayal. The comedy duo, Dumpy and Lumpy, Tish Marshall and Lisa Harnett, worked very well as a pair. I feel that this is another example of a panto tradition that is not always easy to get right but you achieved it here. Quite how you manage so many pratfalls without hurting yourselves I don’t know - at least I hope that you are not too badly bruised! An excellent panto, well written and directed, confidently performed by all on stage and supported by a superb back stage/technical team. Lane End, you can be proud of this one!